Phocas Financial selects and manages equity investments for institutional investors, individuals and investment advisors. 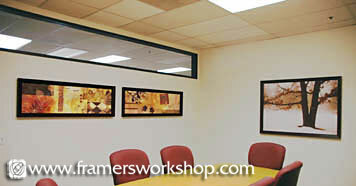 When Phocas Financial Corporation moved to larger headquarters in Alameda, the compnay needed an art and framing consultant to provide them with wall decor which both reflected thier own taste and was suitable for clinet visits. 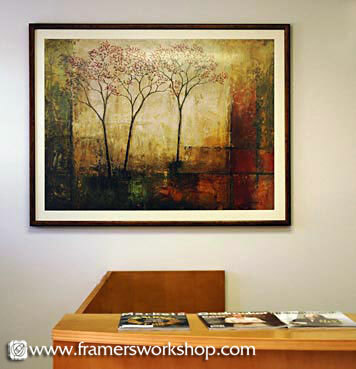 The content for this office was carefully selected from contemporary art print collections. 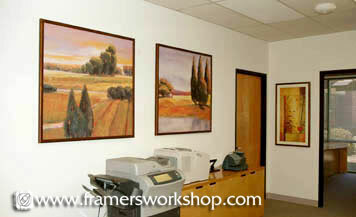 We ordered several specially sized-to-order giclees on canvas for both the main reception area and the conference room, while the remainder of the prints were ordered on paper and framed with mats and anti-reflective acrylic to reduce reflection from florescent lighting. 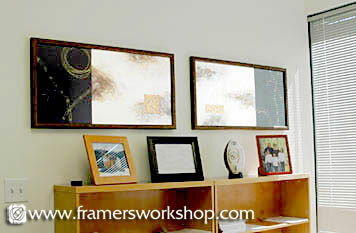 We met with corporate representatives of this company to discuss various themes for the office art. The preference was for bold landscape themes which would not be regionally specific, but would rather harmonize with each other in color and content. 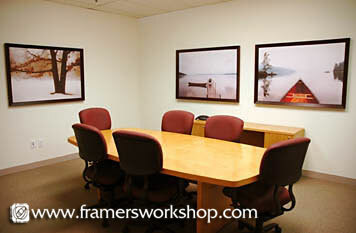 The conference room frames are a deep mahogany to harmonize with the comfortable conference chairs. 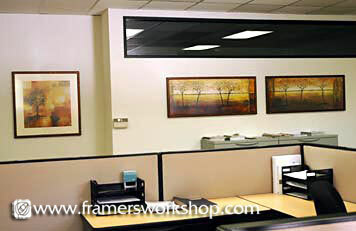 We decorated three walls of the conference room in soothing landscapes, leaving one wall blank for the installation of a flat screen television used for video conferencing and business reports. 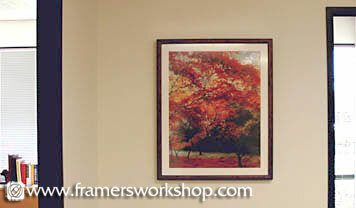 Framing was coordinated throughout the main office area in a deep antique bronze frame. All installations left space for large plants that were to be ordered after the art was in place. 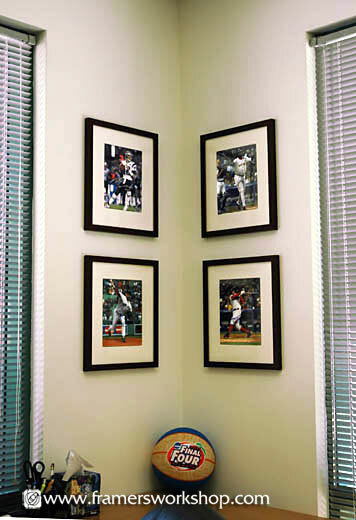 Executives chose individual art and framing for their offices, which made use of both art selected from our catalogues and their own photographs and collections. 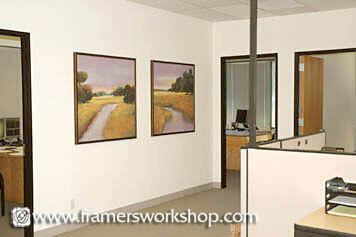 In addition, we installed a few pieces of art which were hanging at the company's previous location.